99.9% of the time, Fridays mean one thing... big hair and leopard print. Today being the exception - I'm en route to London. If you are a regular reader of the blog you will know how much I love leopard print - normally you will see them in outfits via my shoes however on a Friday at work I'm always decked out in leopard print. Not going to blow my own trumpet but the trend is catching on haha. Anyway I've decided that as the weather has been practically tropical (see what I did there), well for the North East anyway I've decided I need to invest in more tropical/leopard prints for the summer - this may also have something to do with the mammoth Jerseylicious marathon I watched the other night. Now I know bright prints such as this isn't for everybody, however you can introduce a teeny bit of print into your outfits through your shoes and these Converse high tops tick the boxes - wear with jeans and a tee, or a plain dress. Look at my outfit photos when I wear my leopard print heels - normally they're with a plain black dress. I'll be honest I can't pick a favourite piece out the lot of them - I'd have to have them all. 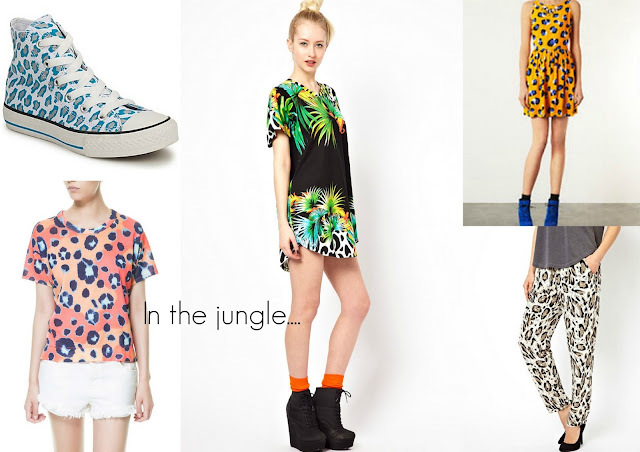 Are you a fan of the bold jungle/animal print?? Looooove the Zara top and the Converse are amaze!